You can rarely find a Mac hack on the internet due to Apple’s high level security. Now, I’ve have worked hard to find a loop hole in the Macintosh operating system. Breaching into Apple’s security and finding a hack is not child’s play. I’ve been using the MacBook Pro for about a year and the iPhone for about 6 months. So, both the Mac and iOS aren’t new to me. Customisability is one thing that I badly missed while making a transition from Windows to mac or from Android to iOS. The Windows is like an open ground; You can plant your own trees and there’s lots of space to play around, but the Mac is a closed room with a concrete floor. At some point of time you would have thought of ditching the default apple canvas background on the login screen and you would have gone all the way to system preferences to change it. Unfortunately Apple hasn’t provided an option to change the background on the login screen on Macbook. Well, I’ve found a hack to change the background screen and also display a custom message on the login screen. You can add any fancy text and this gives your Mac a more personalized touch. Add the your own text between the quotes. 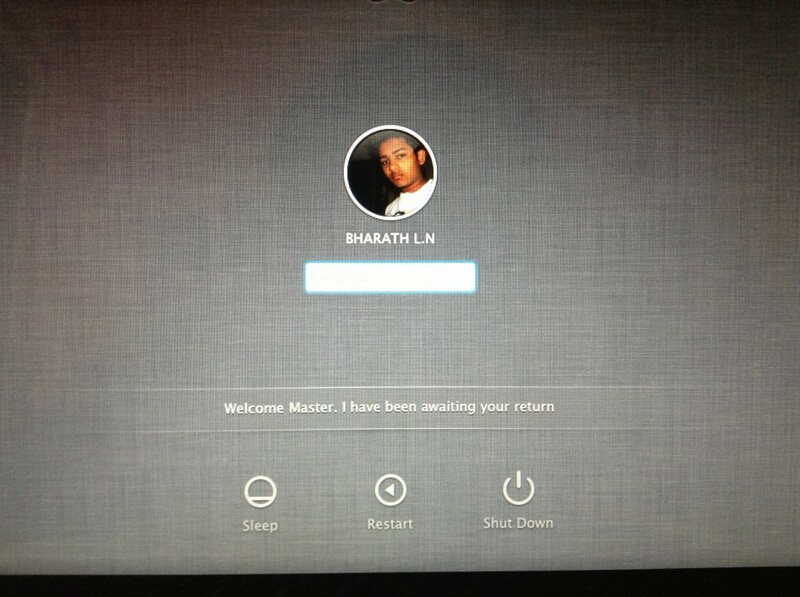 The above command will add a custom message at the bottom of your login screen of Mac. Now, to change the login screen background, open the image file that you would like to use and convert it to PNG format. Save the image as “NSTexturedFullScreenBackgroundColor.png“. Backup the original login screen wallpaper. You’ll find the image at “/System/Library/Frameworks/AppKit.framework/Versions/C/Resources/“. Now replace the original with the new image that you just created. Bingo! and you are done! Logout and look at your new login screen. If you face any problem, feel free to ask via comments! We’ll keep bringing more Mac hacks/tricks. it didnt work for me and i dont know why. i just copied and pasted the command and added the text inside the quotation marks.